When we think of cosmetic surgery, we tend to focus on the cheeks, eyes, and nose. But there are some appearance enhancements that a cosmetic surgeon can’t make: those having to do with your teeth. As more people look to improve their appearance through surgery, cosmetic dentistry and periodontology are experiencing a rise in popularity. In fact, a poll conducted by the American Academy of Periodontology found that smile enhancement procedures outnumbered eyelid surgeries five to one. If you’re interested in improving your smile, we can help in a variety of areas. If you have too much gum showing when you smile, causing your teeth to look short, we call this a gummy smile. If your gum line is uneven, causing some teeth to look shorter than others, we call this a crooked smile. Both situations are easily remedied with a procedure referred to as a gum lift or crown lengthening. During this process, a periodontist (a dentist who specializes in gum treatment) removes excess gum tissue and reshapes the contour of your gums to lengthen the crowns of your teeth and create a natural-looking gum line. Gum recession can be caused by gum disease, vigorous brushing, grinding or clenching, or simply age and genetics. Regardless of the cause, as gums recede they expose the roots of the tooth, and create the appearance of longer teeth. Exposed roots also increase vulnerability to root decay, bone loss, and sensitivity to hot and cold liquids and foods. The solution to this situation is a soft-tissue graft, also known as a gum graft. 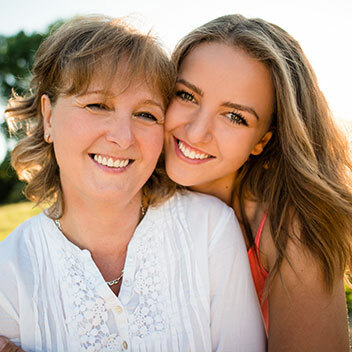 During this procedure, tissue from the top of your mouth or another source is transplanted to the gum area, to cover the roots and restore the gum line to its original, healthy location. A soft-tissue graft protects your roots from decay and helps prevent additional gum recession. Aside from creating distracting gaps in your smile, missing teeth can cause problems with your oral health. To restore your smile to fullness and health, Dr. Egidio recommends implants. An implant is a replacement tooth attached to a synthetic root that is surgically placed into the jawbone. Permanent implant crowns look and feel like natural teeth. Implants can last a lifetime if cared for properly. When a tooth falls out or is removed, an indentation can appear in the gums and jawbone just above the spot where the tooth used to be. This occurs because the jawbone slowly atrophies or disappears in response to the empty space. In combination with replacing your missing tooth, a periodontist can provide ridge augmentation, a procedure in which the doctor will smooth out the indentation to recreate the original curvature of your gums and jaw. This procedure generally includes bone grafting to restore the missing bone, and in some cases must be performed prior to the placement of implants to ensure that sufficient bone is available to retain the implant securely.